James Shepley Chatterton was born on 12th March 1839 at 4.20am in the cottage attached to Adshead Barn Farm House (referred to in the poem below, and pictured below left), at the top of Lord Street, Kerridge (these top two houses are in Kerridge, the rest of Lord Street is in Bollington). 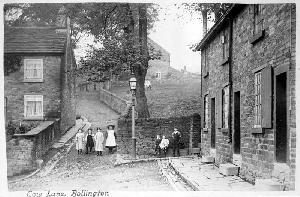 James also had a brother, John (b.1841 Bollington), and a sister, Frances (b.1848 Bollington). 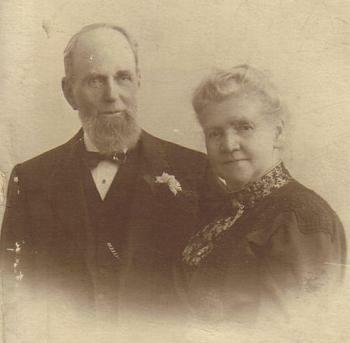 John married Phoebe Ann Barnes in 1862 and Frances married Wood Deane Snape in 1866. James married for the first time at St John’s Church, Bollington, to either a Hannah Leigh or Mary Bowyer, we think! After his father, Joseph Chatterton a cotton carder, died in 1848 his wife, Hannah Cheadle Chatterton (nee Shepley) moved to a cottage in the village. James went to Bury and found work as a carrier or carter with a horse and cart between Bury and Manchester. After his first wife died James Chatterton married Eliza Hayes (pictured) in Prestbury in 1868. They had eleven children of whom three died in infancy. My grandfather was his youngest son, Harold. Two of his sons, John and Ernest, emigrated to Providence, Rhode Island, USA and James visited them there in 1906. James Chatterton, born in the cottage on the left. James became known as the ‘Milestone King‘. He was so called because each year on his birthday a poem appeared in the Bury Times marking a milestone in his life. He submitted his last poem (below) at the age of almost 90 as he lay on his deathbed. He gave instructions that if he lived until his birthday it was to be published. If not it was to be destroyed. He died on his ninetieth birthday and I believe that it was printed. Although living in Bury, James made regular visits to Bollington and climbed Kerridge Hill to White Nancy. He wrote a lovely poem about Nancy (below) for one of his birthday milestones. He retired to Greenmount, Bury, at the age of 60. Both he and Eliza are buried in the United Reform Church graveyard in Bury. The poems below are transcribed from an old typewritten copy of my great grandfather’s words that may have been his original. Some words may be wrongly spelt, others may be contemporary or dialect words that don’t mean anything to us today, but the meaning is clear in the context. A James Chatterton is noted on one of the foundation stones of the Methodist chapel at Whiteley Green. These were laid on 25th June 1904. I believe it to be the same James Chatterton, the subject of this page, because he laid the stone ‘on behalf of Mrs Davies of Bury.’ James then lived in retirement in Bury but remained a regular visitor to Bollington and district. Once a year I have climbed this hill for years past. I climbed it again on July 8th 1919 when the following lines were suggested. I have the strength to climb it still. There’s a scene that’s almost sublime. Are meadows and murmuring rills. From early morning ’til late at night. Where the bluebells are to be had. There cannot be found anywhere. But of the actors but few survives. If only because she is old. Look at the picture of Nancy taken in 1925 and you will see why James Chatterton was so concerned about her condition! For there are no milestones in heaven. Written for his 90th birthday milestone, 12th March 1929, the day he passed away.